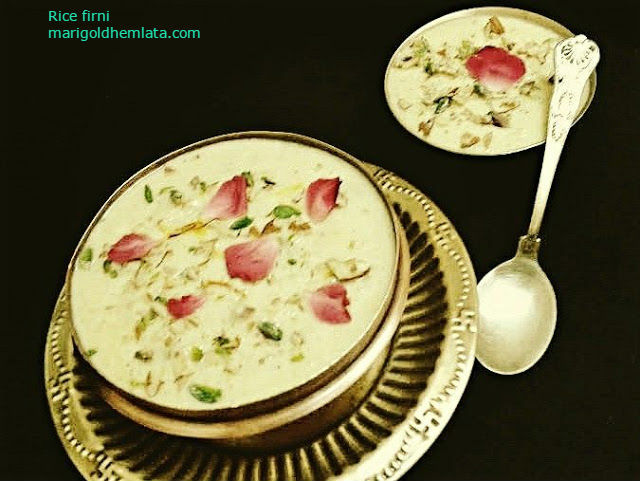 Firni is a complete dessert after a grand main course, occasions, and any type of party. Prepared with grinned rice, sugar, milk and nuts. slow cooked creamy and delicious Firni is best served chilled, garnished with lots of nuts like almonds, cashew nuts, pistachio etc. Here I gave a twist on my Firni, add little powdered fennel and garnish with some rose petal. I just love the rose petal in my dessert garnishing which happens to be my favorite part. Firni is also very popular dessert in north india. To is Diwali accha wala meetha ho jaye. फिरनी चावल को पीस कर बनायीं जाने वाली मीठी डिश है जिसे हम अक्सर बड़े त्योहारों जैसे दीवाली, होली या किसी बड़ी पार्टी के लिए तैयार करते हैं, इसे फुल क्रीम दूध में इलाइची और केसर के साथ पकाया जाता है और जब तक मिश्रण क्रीम की तरह नहीं हो जाता तब तक लगातार चलाते हुए पकाते हैं इसमें पिस्ता, बादाम डाला जाता है यूँ तो फिरनी में केसर का फ्लेवर डाला जाता है पर यहाँ मैंने इसमें थोड़ा सा सौंफ का पाउडर भी डाला है जिसके इसका स्वाद काफी अच्छा हो गया है और साथ ही गुलाब की पत्ती से सजाया है जो की देखने में आँखों को बहुत लुभाता है। तो चलिए इस बार दीवाली पर क्रीमी मीठा ही चख लिया जाये. Keep 2 tbsp nuts for garnishing. Drain and grind the rice into a coarse paste, dissolve the paste in little cold or warm water. Bring milk to a boil then add rice paste and cook the rice and milk together till completely cooked. keep stirring it continuously so it dos not burn. Now add sugar, soaked saffron, fennel powder, and nuts, cook for 5 minute more. pour into the serving bowl garnish with chopped nuts. Chill in refrigerator before serving for an hour.